The fundraising thermometer displays a graphical representation of our efforts in seeking to help the charities we support. Thank you to all those who have contributed. West Midlands Police Dogs have been protecting the lives of the public & their fellow officers since 'Kim' & 'Flash' were recruited to the Force in 1951. Since then Police Dogs have played an important & vital role in locating criminals, finding evidence & ultimately protecting & serving their local communities. During their career, which lasts on average 8-10 years, those courageous Police Dogs often suffer knee, leg & back problems whilst performing their community duties. Although they are treated & cared for at the time, these injuries can very often shorten their life span & usually require further ongoing medical attention long after they retire. Caretaker Mr. Sid Robinson with RWMPD committee member Mr. Terry Grove & trainee Police Dog Monty. Photo courtesy of Mr. Michael Scott. The Retired WM Police Dog Benevolent Fund aims to ensure that all retired West Midlands Police dogs enjoy the retirement they deserve, with the highest levels of ongoing medical care & treatment. Hopefully any heart wrenching decisions about the dog's future will not come down purely to the financial considerations. 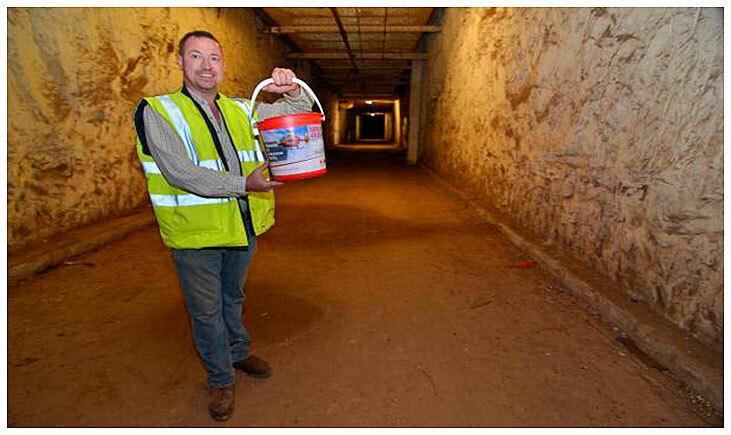 The money raised by The Drakelow Tunnels Preservation Trust, will go towards the re-housing of retired Police Dogs. If you would like to support The Retired West Midlands Police Dog Benevolent Fund or make a donation, please visit their site for more information. 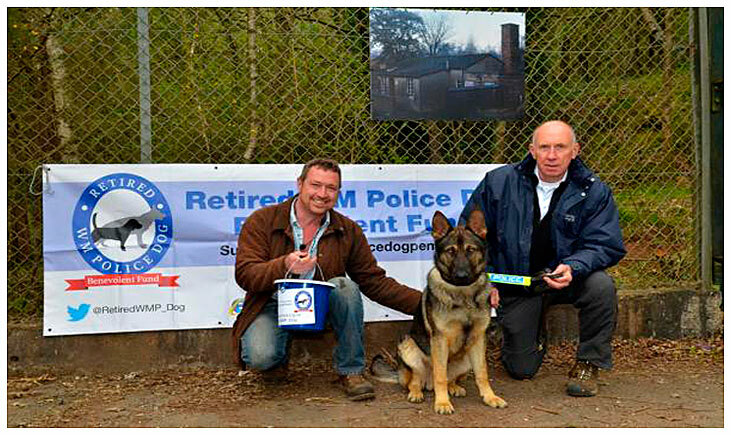 The Retired West Midlands Police Dog Benevolent Fund. The Midlands Air Ambulance is the only charity responsible for funding and operating three air ambulances serving the communities of Gloucestershire, Herefordshire, Shropshire, Staffordshire, Worcestershire and the West Midlands. This constitutes the largest air ambulance operating region in the UK. The Charity needs to raise in excess of £6 million per year to remain operational. It's three aircraft each carry a crew comprising pilot, two paramedics or flight doctors plus full life-support medical equipment. Operating from strategically located regional air bases, the maximum flying time to hospital from anywhere in the region is less than 15 minutes. Caretaker Mr. Sid Robinson collecting donations for the Midlands Air Ambulance. Photo courtesy of Mr. Michael Scott. With the money raised by The Drakelow Tunnels Preservation Trust, The Midlands Air Ambulance were able to buy a new Paramedics Flight Suit. If you would like to support The Midlands Air Ambulance or make a donation, please visit their site for more information. The Midlands Air Ambulance. © Copyright Drakelow Tunnels 2014. All Rights Reserved..